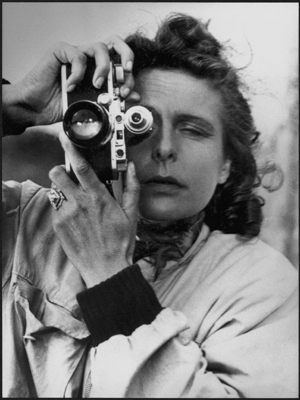 Leni Riefenstahl lived a long and extraordinary life. At different times she was a dancer, actor, film director and photographer, and has been both praised for her exceptional artistic vision and vilified for her links to the Nazi party. Her father was a successful German businessman, but Riefenstahl was interested in the visual arts and initially studied painting. After a period in the 1920s in which she acted in many German silent films, Riefenstahl moved behind the camera and in 1932 both starred in and directed her film The Blue Light. After seeing Adolf Hitler speak at a rally that year, she read his book Mein Kampf and later wrote to him requesting a meeting. Hitler was impressed with her filmmaking and invited her to make a documentary about the 1934 Nazi Party Congress in Nuremberg. The resulting film, called Triumph of the Will, was released in 1935 and used a range of techniques to create an unashamedly propagandist film glorifying Hitler and the Nazi party. Its success led to Riefenstahl being asked to make the official documentary film of the 1936 Olympic Games in Berlin. For this film, called Olympia, Riefenstahl added to the innovative techniques used on Triumph of the Will to create a visually stunning celebration of the Games. She directly drew inspiration from statues of Olympic athletes in Ancient Greece, and she captured the modern Olympians in heroic and idealised poses. In these celebratory shots, some of which were made before the Games began, athletes were often shown naked or semi-naked and she was praised for her powerful depiction of the human form (see ‘The Discus Thrower’). Riefenstahl had an unusually large budget for the film and 30 cameramen were used to cover the full range of Olympic events. In the main stadium, she had pits dug in areas where athletes were competing so she could shoot them from low angles against the background of the sky, exaggerating their physical stature and emphasising their athleticism. 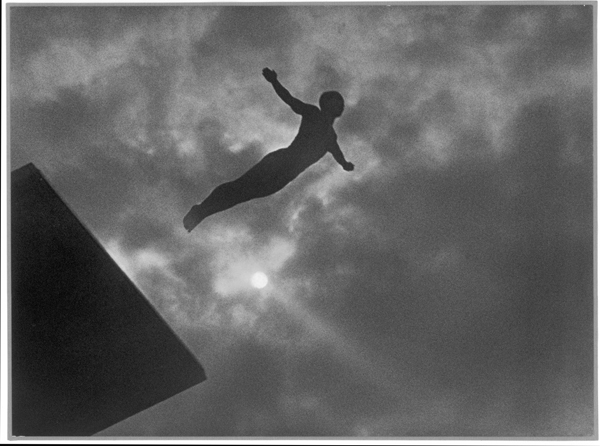 Away from the main stadium, Riefenstahl shot groundbreaking sequences of rowers, marathon runners and divers. For the latter scenes, she shot from a position below the high board to freeze the diver in flight (see ‘The Highboard Diver’). ‘I edited to highlight the diving itself and the movement,’ Riefenstahl later commented. ‘They looked like birds swooping through the air.’ She also had an underwater camera being operated under the pool’s surface, waiting to capture divers entering the water. This was the first time an underwater camera was used to shoot a sporting event. The film was seen as a masterpiece and is regarded as one of the greatest sporting documentaries of the 20th century, but it also had propaganda value for Hitler’s regime. Some cultural commentators, including Susan Sontag, have seen Riefenstahl’s obsession with masculine physical power in the film as evidence of her ‘fascist aesthetics’. Riefenstahl continued her support for Hitler during the Second World War, sending him a congratulatory telegram when German troops occupied Paris. At the end of the war, she was detained by Allied forces and held at various locations for the next three years. Her Nazi associations resulted in her being shunned by many in the film industry and she found it impossible to get any of her film projects off the ground. Instead, she turned to still photography and initiated several documentary projects. In the 1960s, she began photographing the Nuba tribesmen of Sudan and her work resulted in two successful books: The Last of the Nuba (1974) and The People of Kau (1976). Riefenstahl remained active despite the passing years and her link to the Olympics remained strong. She photographed the 1972 Munich Olympics and was a guest of honour at the Montreal Olympics four years later. She trained as a scuba diver at the age of 72 and subsequently published two books of underwater photographs called Coral Gardens (1978) and Wonders Under Water (1990). She was involved in a helicopter crash in Sudan in 2000, when she travelled to the region in an attempt to find out what happened to her African friends during the long-running Sudanese civil war, but recovered from her injuries. Riefenstahl was still active and regularly scuba diving at the age of 100, but her health gradually failed and she died the following year. Her obituaries reflected the conflicting attitudes towards her, which she provoked throughout her life. In later years, Riefenstahl admitted that she had regrets but denied guilt or wrongdoing, and always avoided political comment. Books: Leni Riefenstahl: A Memoir (published by Picador, 1995) offers Riefenstahl’s own perspective on her colourful life story. For a more critical viewpoint, see Leni: The Life and Work of Leni Riefenstahl by Steven Bach (published by Abacus, 2007). Websites: Riefenstahl’s film Olympia can be seen on www.youtube.com or DVD (available on www.amazon.co.uk and www.play.com). Riefenstahl’s official website is www.leni-riefenstahl.de/eng and includes biographical material and a range of photographs from the different stages of her career.